High-tech sewing robots are “interesting” and could change how some companies make clothes, but in the near-term they still can’t beat cheap human labor on cost. (And) while robots can work easily with stiff materials, such as sheets of metal or plastic, they can’t yet work with soft, flexible fabrics that stretch and distort during sewing. Hong Kong’s Crystal Group makes clothes for many of the world’s clothing giants, including H&M, Gap, Fast Retailing (owner of Uniqlo), and L Brands (owner of Victoria’s Secret). It’s the world’s largest apparel maker by production volume, according to research firm Euromonitor, and attracted attention in October for having the biggest IPO on the Hong Kong stock exchange since 2015. It’s the sort of company you might expect to be pouring R&D money into automation, as labor costs rise in China and the world prepares for a future of robots taking over more repetitive, manual tasks, such as stitching clothes. But that’s not the case, says Andrew Lo, CEO of the Crystal Group. In an interview with the Financial Times (paywall), Lo says high-tech sewing robots are “interesting” and could change how some companies make clothes, but in the near-term they still can’t beat cheap human labor on cost. 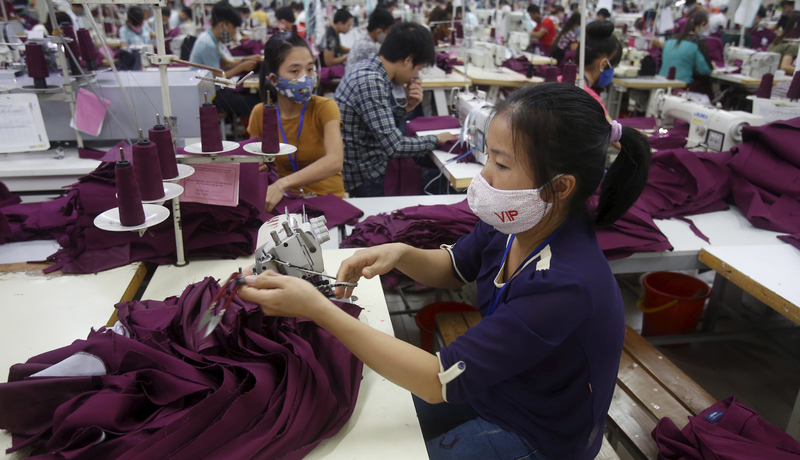 Crystal Group plans to increase its human staff in Bangladesh and Vietnam—garment hubs with some of the lowest wages in Asia—by 10% annually in the years ahead. Currently about two-thirds of its sales are made from clothes produced in Bangladesh, Vietnam, Cambodia, and Sri Lanka, which have all become more attractive to garment manufacturers as producing in China, still the global leader in clothing production, gets more expensive. Experts are cautiously watching how automation might affect the garment industry, which is a lifeline to millions of less-skilled workers in Asia and elsewhere, even as many of the jobs can be exploitative and dangerous. The International Labor Organization warned in 2016 that robots could replace the majority of textile, clothing, and footwear workers in Indonesia, Vietnam, and Cambodia in the coming decades. These workers could move into better jobs, but only if governments and employers start training them for those more skilled roles sooner than later. For now, at least, Crystal Group will not be replacing humans with machines. One reason is that while robots in use in other industries can work easily with stiff materials, such as sheets of metal or plastic, they can’t yet work with soft, flexible fabrics that stretch and distort during sewing. “The handling of soft materials is really hard for robots,” Lo said. A few companies believe they’ve solved the issue. Sewbo treats fabrics so that they become stiff and rigid for stitching, but return to normal when rinsed in hot water. SoftWear Automation, meanwhile, created a robotic table that uses machine vision to adjust on the spot to stretching and distortion in the fabric as it sews. SoftWear says one of these sewbots can make as many t-shirts per hour as about 17 humans working in a conventional set-up. But Palaniswamy Rajan, SoftWear’s chief executive, admitted to the Financial Times that, when it comes to price, his sewbots can’t beat workers in Bangladesh. The original aim of SoftWear’s technology was to make clothes more cheaply in the US, where human wages are much higher. Rajan says robots could still be the best option for producing locally in the US when you factor in shipping costs, import duties, and the advantage of short lead times. For now, though, most brands will likely keep their production in Asia, where it will be done by human hands.